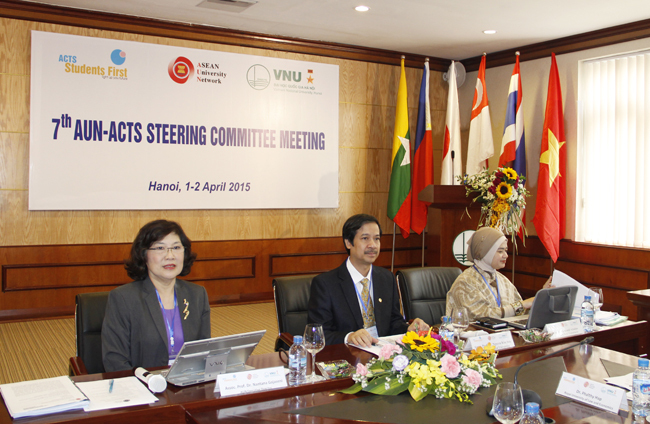 HA NOI (VNS) — Representatives from over 25 member universities of the ASEAN University Network (AUN) gathered at the two-day annual Steering Committee Meeting of the ASEAN Credit Transfer System (ACTS) in Ha Noi, which ended yesterday. Hosted by the Viet Nam National University, Ha Noi (VNU – Ha Noi), the 7th event focused on how to develop the network sustainably and smoothly. Participants debated the expansion of the credit transfer system at both university and postgraduate education programmes. They also promoted credit transfers between the AUN and other universities outside the network. Southeast Asian universities are focusing on enhancing integration and access to international education standards. The conferences offered a forum for regional universities to decide a common AUN education standard, increasing the effectiveness of co-operation among the universities. VNU – Ha Noi Vice Rector Nguyen Kim Son said his university would contribute to building AUN policies as well as developing scholarship sources for students as part of its efforts to ensure sustainable operation of the network's credit transfer system. AUN Management Director Nantana Gaiaseni said since its first meeting in 2009, ACTS activities had developed, adding that she hoped additional non-AUN members would join the ACTS. By February 2015, 1,518 credit transfer programmes had been implemented within the network.